Golf, when played well, looks an easy game. We know it isn’t and at times it can be very frustrating. I take a ‘personal’ approach to golf instruction - simply because every one of us has a different golfing DNA profile, and my role is to work out what is correct for you. I do not conduct ‘single method’ teaching but instead have an open minded approach to assessing what is best for your golf and how I can give you an efficient swing, quality short game and improved results. In my role as your coach, I will analyse your golfing DNA components, identify your strengths and weaknesses, then work on specifics designed to improve your long and short game performance. Whether you are a beginner, a club golfer or a professional, I apply this approach to all of my pupils and make sure that the instructions for correction and improvement are clear and simple, as well as wholly appropriate to you, so that you can follow your tuition with effective practice. Proof of the success of this formula is shown in the results achieved by many of my pupils. The Tour pro’s I have taught have 4 Tour victories to their credit during their time with me, 2 on the European Tour and 2 in Asia. Countless club golfers whose handicaps were stuck or rising have seen that trend reversed as they enjoyed success in club competitions and other local events. Of the many juniors I have worked with, several have represented their Club,County and even their Country. I have also helped some of them secure places in USA golf colleges. Whatever your age or ability, improvement and increased enjoyment is possible for everyone and I will work tirelessly to help you achieve these objectives. I am pleased to report more great results for my pupils through their determination and endeavour. Whether it be handicap reductions or tournament wins, the success rate is high, so well done to all of you. With around 50% of the average golfer’s shots played on or around the green, a good short game is vital. In the Spring of 2016 I discovered the ultimate route to chipping, putting and bunker play efficiency through simplicity. I have used this original approach with many pupils since then and the difference it has made across the board has been astounding. I cannot find my method in any textbook, so for a truly original approach to better ball striking, distance control, spin and release, call me and book a short game lesson now. There is no point in asking you to embark on changes to your positions or movement if you do not understand the reason for such changes, so I always like to ensure you have the clearest possible understanding of them. Rocket science it is definitely not but you will be given relevant information, and video footage when appropriate, to allow you to progress knowledgably and positively. Every teacher has a particular style and I am no different. Three teachers have influenced my teaching over the years. There is no greater gift than a skill for life, and golf tuition vouchers make a fantastic present. You choose their value and the recipient then takes the lessons at a time convenient to them. Simply call or email me I will send the voucher to you within a day or two. The large number of tuition offerings means that it is impossible for me to cover every scenario. Once I know your tuition requirements I will be pleased to give you the relevant price details. So whether you would like to enjoy improvements in your own golf or treat a friend to some lessons, contact me now by e-mail on lee@personalgolf.co.uk or call me direct on 0774 007 2000. Half hour lessons can put your game back on track if your fault is a simple one to fix, but I suggest your first ‘Personal’ golf lesson with me should be for one hour to allow for a full and correct assessment. This assessment will also include an equipment check to ensure your clubs are not an unnecessary handicap and that they compliment your ‘Golfing DNA profile’. I am constantly asked if I do a course of lessons and my ‘PRO PLAN’ is the most popular format for long term improvement and game development. This plan gives you versatility in your tuition and consists of a one hour assessment lesson followed by a further five x 30 minute lessons, or three 30 minute lessons and a 5 hole playing lesson. As well as giving you all round game improvement, this plan is cost effective too and gives you the equivalent of seven x 30 min lessons for the price of 6. The ‘EXECUTIVE PLAN’ is an extension of the ‘PRO PLAN’ and it consists of a one hour assessment, followed by six x 1 hour lessons or four x1 hour lessons and a 9 hole playing lesson. My lesson diary has availability Tuesday to Saturday most weeks, plus one or two Sunday mornings a month. 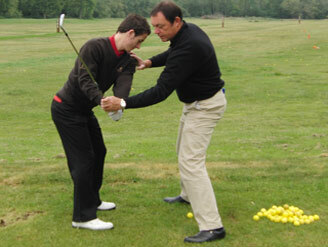 Evening tuition is also available Wed/Thurs from April to September. All lessons are available by appointment and the further you book in advance, the greater the availability. I will always do my best to accommodate your requirements whenever possible. My lesson diary has varied availability each week, however I do teach most Saturdays and 2 or 3 Sundays each month. Lessons are available by appointment and I will do my best to accommodate specific requirements whenever possible. Please call for up to date availability.. If you would prefer to learn with other people of a similar standard, I host one hour lessons for groups of between 2 and 6 people. As all group lessons are tailor made just let me know how many are in your group, what is the current general standard of play amongst the group and which day of the week and time suits you best. I will then structure the course content to include long game, short game and playing, all at a cost effective price. My Winter Golf /Tuition Series is quickly growing in popularity, as golfers are increasingly fed up with cold winters and wet courses in the UK and northern Europe. From humble beginnings of one week in February 2017, I will be running 10 weeks in the 2018/19 winter months. Each participant will also receive two 40 minute 1-2-1 lessons on separate days, and will leave with a game improvement plan. From the moment the group meets on the opening night, it virtually becomes a bespoke week. There is the opportunity to play five rounds of golf on excellent courses, but as with the tuition, each participant can go at their own pace and opt in or out to suit their needs. Time off is important in golf and there will also be the opportunity to sightsee or simply relax at the venue during the week. With a limit of 9 players each week, it is my intention to golf with the group on 2 of the days and I like to play 6 holes each round with each 3 ball. The golf is all very relaxed but for those with a competitive edge I run an informal stableford competition each day. Club golfers of all handicaps are welcome, as are single golfers. NB. These prices are based on sharing a twin/double room. Single room supplements are available upon request. Flights are not included in the prices as participants come from all parts of the UK and Europe. All enquiries, expressions of interest or bookings should be directed to Cecile Couval of experienced golf travel company Golf Par Excellence. I will also happy to answer any questions you may have. Please join me for a week of enjoyable golf and company, and let me improve your game at great venues.